"Card's for sorrow, Card's for pain" and now cards for collectors. The cards are supplied in a nice solid plastic case, which will help protect the ones that are going into collections. The card faces are standard and there are three Joker cards and a bridge standard instructions card included as well. It would have been nice to have the individual cards for Queen, King, Jack and Ace customised as well, but that would have pushed the price way too high for most people and wouldn't have been commercial. 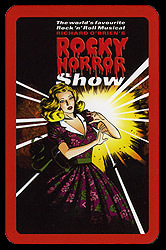 Currently only available to buy at the Rocky Horror UK stage show venues during performances, the cards are £5 per pack. Updated Sunday, July 16th, 2006. The cards now come in Rocky themed boxes with the main Rocky logo on one side and the legend Cards for Sorrow, Cards for Pain on the back of the box. 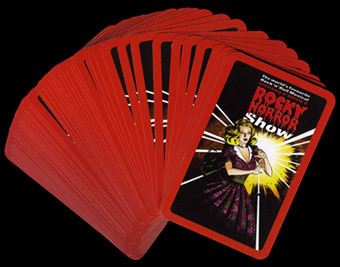 And now a suggestion for using the cards to play a game, rather than just throw around the theatre. Rocky Horror Strip Poker how to play: loser has to put some clothes on!